American Fight League has revealed there full 16 fight mma card for Southwest Brawl 8. 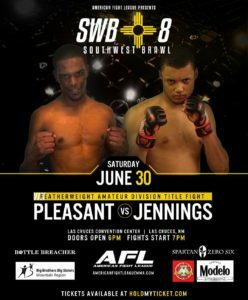 Southwest Brawl 8 is scheduled for June 30th at the Los Cruces, Convention Center and is headlined by a 180 lbs. catchweight bout between Steven Ortega & Danny Grado. 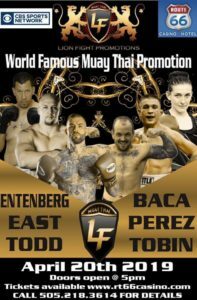 The new additions include 3 pro bouts. At Middleweight Los Cruces’s own “Wreck-It” Randy McCarty faces Farmington’s Chris “The Lightning” Leyva. 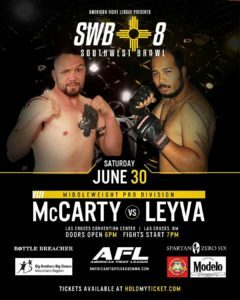 McCarty a Boxer and Mixed Martial Artist, who always makes the fight exciting, looks to rebound from losing to Kobe Ortiz at Southwest Brawl 7. Leyva a King of the Cage & Bellator vet, with 6 knock outs to his credit, will be stepping into the cage for the first time since November of 2016. In a 140 lbs. catweight it Castillo against Castillo as Paco Castillo fighting out of Force of 1 faces El Paseo, Texas’s Brain Castillo. Paco is a will head into his 43rd fight and he’s finished 75% of his wins by submission. Brian has competed in the sweet science and in the cage with finishes in half his wins, but hasn’t competed in the cage since August 2016. Lastly on the pro side at Featherweight from 10th Planet El Paseo Juan Gandra squares off with Xavier Estrada from Lubbock, TX. Gandara submitted Steven Ojeda by rear naked choke in under a minute, in his pro debut at Southwest Brawl 7. Estrada from what I could find has both his wins by knock out and is returning to action for the first time since April of 2014. 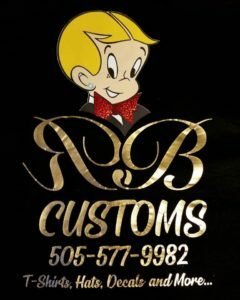 The will see a pair of title fights.First off at Bantamweight 10th Planet El Paso’s Ricky Maynez faces Albuquerque’s Claob Ramirez for the AFL amateur Bantamweight belt. Maynez was expected to fight for this same title at Southwest Brawl 7, but the promotions had troubles finding an opponent, after several tries. Maynez last fought at JacksonWink Fight Night 2, taking a split decision from Alex Jones Ramirez has 7 of 8 wins by finish, 4 by knock out. Ramirez won 3 fights, 2 knock out and a submission, in 2 days back July of 2071, in Mexico at the WMMAA Pan-American Championships. And James Pleasant from 12th District meets Richard Jennings from Desert Dynasty for the AFL Amateur Featherweight title. Jennings a high level Taekwondo practitioner, has showed off his full arsenal of skills in decision wins over Randy Baker & Jonathan Juvera inside the AFL cage. Pleasant has a slick ground game, that has led to all his victories coming by submission.